THERE ARE LINKS ON OUR SITE & BELOW THAT WHEN USED FOR SHOPPING OR EVEN JUST SEARCHING, OFFER US A SMALL DONATION EACH TIME STORES OR SITES ARE ACCESSED VIA OUR POSTED LINK. So an easy NO COST way to help out rescue is simply a click away. While shopping or buying holiday gifts or just household & personal items, please utilize these links; in these challenging financial times every little bit helps more than you might realize. THANKS ~ HAPPY SURFING & SHOPPING! OUR NEW SWGSR GOLF SHIRTS ARE HERE!! FOSTER HOMES!!! We are in desperate need of temporary foster homes to house some of the dogs already in our rescue. We are not a shelter nor a "kennel." All of our rescue kids are placed in loving foster homes prior to placement. Without additional foster space, we cannot continue to take in dogs that are desperately in need of our help. Shadow gives one of our angels a thank you kiss! 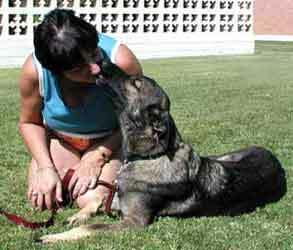 Southwest German Shepherd Rescue is an Arizona non-profit corporation organized for charitable purposes as defined under 501(c)(3) of the IRS Code. DONATIONS ARE TAX DEDUCTIBLE.